Epistasis Blog: Probabilistic multifactor causation - what do we mean? Probabilistic multifactor causation - what do we mean? This four-part blog post on genetic causation is well worth the long read. I highly recommend it. It is written by Dr. Anne Buchanan and Ken Weiss from Penn State. It is part of The Mermaid's Tale blog. Who, me? I don't believe in single-gene causation! (or do I?). Part I. What does it mean? Who, me? I don't believe in single-gene causation! (or do I?). Part II. Probabilistic causation--what do we mean? Who, me? I don't believe in single-gene causation! (or do I?). Part III. Probabilistic multifactor causation--what do we mean? Who, me? I don't believe in single-gene causation! (or do I?). Part IV. Do we need the probabilistic hypothesis? 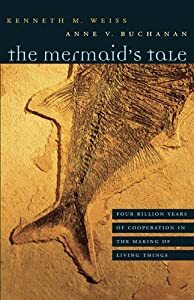 Be sure and read their awesome book titled "The Mermaid's Tale"
Things genes can't do. Shall we have pie or stew?